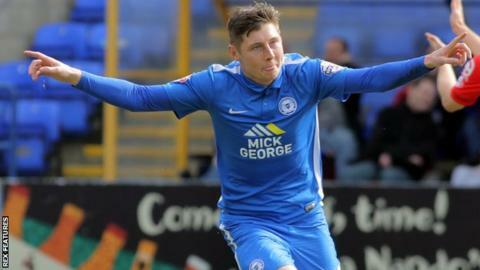 Harry Beautyman scored twice as Peterborough edged League One basement side Crewe closer to the drop. The midfielder, who ended a 13-month goal drought against Coventry on Good Friday, lashed home the opener before doubling Posh's lead after Alex keeper Ben Garratt had denied Aaron Williams. Lee Angol sealed United's third straight win with a rasping finish from Marcus Maddison's fine pass. The visitors offered little as their winless run stretched to 11 games. Crewe are now 12 points from safety with just six games to go, while Peterborough stayed 14th. Match ends, Peterborough United 3, Crewe Alexandra 0. Second Half ends, Peterborough United 3, Crewe Alexandra 0. Michael Smith (Peterborough United) wins a free kick on the right wing. Corner, Crewe Alexandra. Conceded by Jack Baldwin. Corner, Crewe Alexandra. Conceded by Michael Bostwick. Attempt saved. Marcus Maddison (Peterborough United) right footed shot from outside the box is saved in the top centre of the goal. Attempt saved. Harry Beautyman (Peterborough United) right footed shot from outside the box is saved in the centre of the goal. Attempt missed. James Jones (Crewe Alexandra) right footed shot from outside the box is close, but misses the top left corner. Corner, Crewe Alexandra. Conceded by Simon Gillett. Attempt missed. Jon Taylor (Peterborough United) right footed shot from the centre of the box is close, but misses to the right. Substitution, Crewe Alexandra. George Cooper replaces Lauri Dalla Valle. Substitution, Peterborough United. Simon Gillett replaces Chris Forrester. Oliver Turton (Crewe Alexandra) wins a free kick on the left wing. Attempt missed. Oliver Turton (Crewe Alexandra) right footed shot from outside the box is close, but misses the top left corner. Attempt missed. Charlie Kirk (Crewe Alexandra) right footed shot from outside the box is close, but misses to the right. Goal! Peterborough United 3, Crewe Alexandra 0. Lee Angol (Peterborough United) right footed shot from the centre of the box to the bottom left corner. Assisted by Marcus Maddison. Attempt missed. Callum Ainley (Crewe Alexandra) right footed shot from outside the box is just a bit too high. Corner, Crewe Alexandra. Conceded by Michael Smith. Substitution, Peterborough United. Jon Taylor replaces Aaron Williams. Substitution, Crewe Alexandra. James Jones replaces Billy Bingham. Marcus Maddison (Peterborough United) hits the bar with a right footed shot from the centre of the box. Corner, Crewe Alexandra. Conceded by Ben Alnwick. Corner, Peterborough United. Conceded by Jon Guthrie.